The Canterbury and District Bat & Trap League came into existence in the summer of 1921 when the league was conceived by a gentleman called Bill Humphries. He spent that summer codifying the rules, establishing a standard size for pitches and equipment, and persuading a number of pub landlords to lay their grounds out to these standards in preparation for an inaugural season in 1922. He was reasonably successful in his endeavours, as in May 1922 the first season of the Canterbury Bat and Trap league was able to get underway. There were six founder members of the league with teams being entered from The Brewers Delight, The Rising Sun, The Two Brothers, Ye Olde Beverlie, The Royal Artillery -all from Canterbury pubs, and The Golden Lion at Broad Oak. The Golden Lion and The Two Brothers are the only two from the founding six that still play in the league, but these days the latter play their home matches at The Kings Head, Wincheap as The Two Brothers pub itself was closed decades ago. Generally, there was a steady expansion of the league during the 1930’s, despite economic factors then prevailing that would have restricted the spending power of the players. 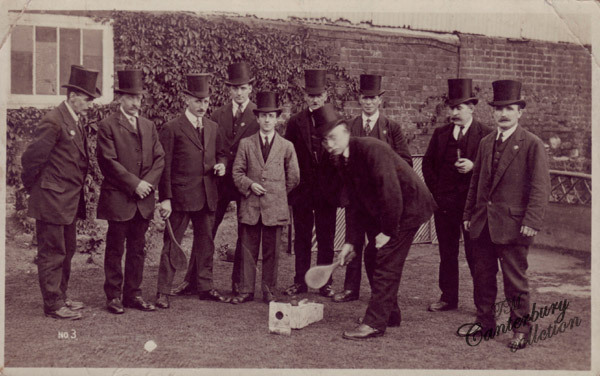 Clearly, the game of Bat & Trap was as addictive to it’s pre-war players as it is to the current crop of enthusiasts. The close of the 1939 season terminated Canterbury League matches until the conclusion of the Second World War in 1945. There were four divisions at the end of the 1939 season and a letter from the League Secretary of the time, Mr R W Humphrey, requested that the Beaney Institute in Canterbury hold the League’s seven trophies in their strong room for the duration of the war. Mr R Surtees , Custodian of the Institute, appears at first to have declined the request, but soon changed his mind. With the end of the European phase of the war, the League’s activity resumed – but only to play the various knockout events – The Henry Court and Charles Skam Cups as well as the singles knockout competition. The League committee also introduced a doubles knockout tournament in 1945. Full League fixtures were resumed in 1946. The League continued to flourish, with a slow expansion, until in 1951, when a major change occurred in the regulations for playing the game. It became a League rule that every league team had to have its pitch floodlit. This meant that the starting time for matches could be moved from 7pm to 8pm. This made a big difference for the players, who mostly worked the land and normally meant working in whatever hours of daylight there were. The League were the first sporting organisation in Britain to require its member clubs to have floodlights (four years before floodlights were sanctioned by the Football Authorities). In 1952, inspired by the Festival of Britain, the Canterbury Ladies League came into being and there was soon sufficient interest for this to quickly develop into a three division league. With the improved social and financial conditions prevailing through the 1960’s and 1970’s, the League continued to expand, hitting a peak of eighty teams in eight divisions in 1982. It was decided that this level was the optimum at which the League could be administered effectively. New teams seeking to enter the League had to wait for a vacancy to be created by another team leaving. This situation lasted for four years and, thankfully, no longer prevails with all requests for entry into the League welcomed, considered and almost invariably concluding with an invitation to join. The creation of a breakaway league (The Friendly League) in 1986, saw a steady erosion in the membership of the League, which had, by the end of the 1997 season had 58 teams in seven divisions. By 2006 the League had dropped to 45 teams in five divisions and by the end of the 2014 season, this had been reduced to 36 teams. It is of some interest to compare the game as it was played in the 1920’s with the game as it is currently played. Teams, then were of ten players – now the league consists of eight with other leagues in Kent consisting of six players. Matches start later, as noted in the comment on floodlighting. Games always finish nowadays on the same day, whereas in the early years they often had to be resumed on another day because darkness had set in! The Canterbury League, geographically now embraces Faversham, Whitstable, Herne Bay, Chartham and many other outlying villages. Yet, despite many changes to the rules of the League, the laws are still essentially those that were codified by Bill Humphries in the summer of 1921. The game is also known to have been played in isolated pockets on a non-league basis in places as close to London as Biggin Hill, home of the famous World War II Battle of Britain airfield, only a few miles from the centre of London. The game has also spilled over from Kent and is played in the neighbouring county of Sussex, although ”Stoolball” (a slightly different version) is more predominant. Similar games are also played in North Yorkshire (”Knurr and Spell”), in Lincolnshire (”Rat in the Hole”) and in various forms in other parts of the country. It is also played in many European Countries, particularly within the EU, as a result of two twinning exchanges with Kent towns. It is also known to be played in certain parts of the USA, Australia and New Zealand, predominantly by ex-pats although in the USA the interest also arises from links with the history of baseball. Whereas there were probably no more than seventy players world-wide in 1922 (all of whom were in Canterbury), it is certain today that numbers playing in the various leagues exceeds over 1000. with many more playing casually through social evenings arranged by social clubs and other groups such as Rotary, Round Table and Lions etc. There are still many unanswered questions about our game and our resolution must be to help fill in the missing details in the history of Bat and Trap. For example, reference has been found to an All England Trophy – a delightfully whimsical concept for a game which is predominantly played in only one area of the UK. Although , of course, our cousins across the pond do have the World Series for an essentially domestic sport. Which brings us on nicely to 2014, which saw the first World Cup of Bat and Trap, as teams from the various leagues around the county played in a full one-day event, hosted at the Red Lion, Dunkirk. This is now hoped to be a annual event hosted by a different league every year and maybe in years to come, bringing teams in from outside of the county and the UK. Closer to home, The Canterbury and District League and the Sevenoaks and District League got together in late 2011, to form the Kent Challenge Cup in which the respective winners of the two leagues play a two legged challenge match first played in April 2012, now played annually as a pre-season challenge. This antique game of ours is most definately in fine fettle.